The bedroom is where you spent an average of 8 hours sleeping… often with millions of unseen dust mites. These tiny little pests often cause no problems to you, unless you’re allergic to their excretion. That’s when you’ll want to consider getting rid of dust mites in your bedroom. If you’ve ever consulted a doctor for dust mites allergy, you’ll get the advice of deep cleaning your bedroom and to do so regularly. The bedroom is often the primary suspect of the source of dust mites. But why is that so? You’ll need to take a deeper look into the biology of dust mites for clues of why a bedroom is a conducive place for them to grow. Like any living organisms, dust mites thrive in certain environments. These microscopic bugs will find any place with a temperature of 68 to 77 degrees Fahrenheit and humidity between 80%-90% ideal to grow. But often, the key factor that makes your bedroom a favorite spot for dust mites is the endless source of food they could get. Dust mites feast on dead skin cells shed by humans. An individual shed at least one million dead skin cells a day. Considering how you spent 30% of your day in the bedroom, it wouldn’t be surprising that you’re nourishing armies of dust mites in the bedroom. It doesn’t take a genius to guess where you could find the favorite spot for dust mites in your bedroom. The answer naturally points to your comfortable bed, where you spent 6-8 hours sleeping on and shedding dead skin cells each night. Measuring approximately 0.3 millimeters in size, it’s unlikely that you will notice these tiny bugs. So how do you know if you have an infestation of dust mites in your bedroom? The truth is, most of us are co-habiting with dust mites without realizing it. That’s because not everyone is allergic to dust mites. But if you start developing some of these symptoms, chances are, they might be caused by dust mites that are infesting your bedroom. Irritated and teary eyes – This can easily be mistaken for normal allergic from outdoor dust exposure. 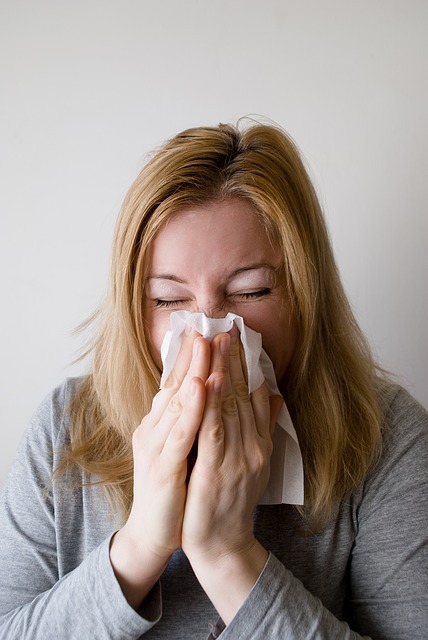 But if the condition persists indoor, you can be sure the allergen originates from home. Nasal blockage – It first starts off as a runny nose. When left untreated, you may find that the inner passage of your nasal is inflamed and soon, it may affect your breathing. Dry throat and coughing – Coughing is also part of the symptoms associated with dust mites. If you’re sure you’re not catching a virus, then it may be the presence of dust mites at home. Aggravate eczema – Some people who are suffering from eczema may find the skin condition getting worse when exposed to dust mites excretion. Part of the skin may crack and that leads to a painful experience. While these symptoms may suggest that you are developing dust mites allergy, it is prudent to consult your doctor for a proper diagnosis. Your doctor will suggest the proper medications while you’re trying to get rid of dust mites in the bedroom. After my 6 years old son suffered from dust mites allergic for months, the first place where I turned all my cleaning efforts to is the bedroom. You’ll want to do the same too if dust mites are causing much distress to your health. 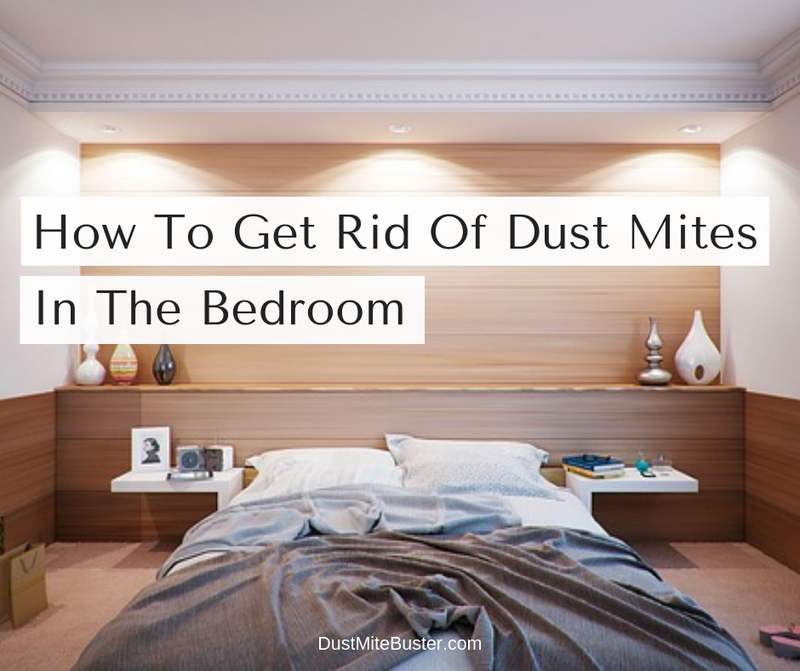 Here are what you can do to get rid of dust mites from the bedroom. I ditch my old vacuum cleaner for a newer one. One that is more powerful when it comes to removing dust mites from the floor. When choosing a vacuum cleaner, it’s important that you get one that is fitted with a HEPA filter. A HEPA filter traps fine allergens including dust mites when it has sucked them off the surfaces. You’ll also want to use a bagless vacuum cleaner because the conventional bag will spread dust all over the air when you’re trying to empty it out. It’s a bad idea to send all the dust mites to the air again after spending a tough time getting them in. Never wait for specks of dust to build up before you start vacuuming. You’ll want to vacuum your bedroom, particularly the hidden corners beneath pieces of furniture at least once a week. There are some spots where it’s hard for the vacuum cleaner to reach. For instance, the top of a rack, part of the bed frames or windows. Wiping these spots with a wet cloth helps to get rid of the dust and any dust mites that are on the surface. You’ll want to avoid using a feather duster any equipment that can send the dust spreading into the air. If you’re suffering from nasal allergy, protect yourself with a dust face mask. Dust mites can make soft fabrics a perfect hiding place and some may escape being sucked off by the vacuum. This leaves you no choice but to turn on a steam cleaner. The steam cleaner uses high-temperature vapor to eliminate the dust mites. 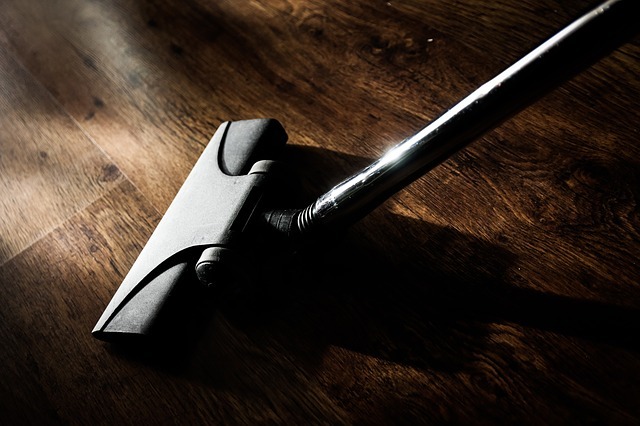 Steam cleaners have been proven as an effective and efficient way of killing dust mites, according to a study conducted by the University of Glasgow, UK. It may help to use a handheld steam cleaner, as it allows you the flexibility to clean on any surfaces and items in the bedroom. The common suspects are the carpet, curtain, mattress, and upholsteries. While steam cleaning can be effective, you’ll want to avoid using it on a latex-core mattress as it may overheat and damage the latex. When dust mites are rampaging in the bedroom, turn to the kitchen and rummage for a pack of baking soda. Sprinkle it on the carpet or mattress and leave it for about twenty minutes before vacuuming the residues off. Chances are, you’ll be vacuuming a huge number of dead dust mites too. 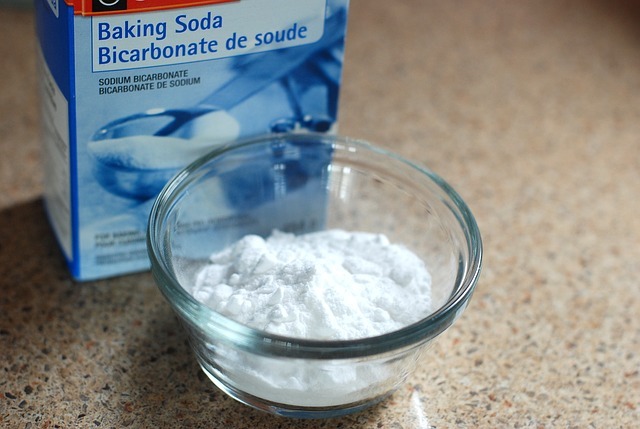 The efficacy of baking soda lies in its chemical properties. It can remove stubborn stains, and works well in eliminating various allergens. This simple trick is known to most wise grandmothers. Diatomaceous earth isn’t a common word that you heard off each day. As unfamiliar as it is, diatomaceous earth has been proven to be effective in killing dust mites. The term refers to fossilized remains of a particular type of hard-shelled algae and has been used in various industrial processes. These fossilized algae are available in powder form. To kill dust mites, sprinkle diatomaceous earth over the infested surface. Wait for a few hours before vacuuming the surface. Diatomaceous earth works by removing fluid from dust mites which are protected by its exoskeleton. You’ll want to pay attention to the type of diatomaceous earth as those containing high crystalline content can cause side effects to humans. Choose non-crystalline and preferably food grade diatomaceous earth to battle dust mites in the bedroom. 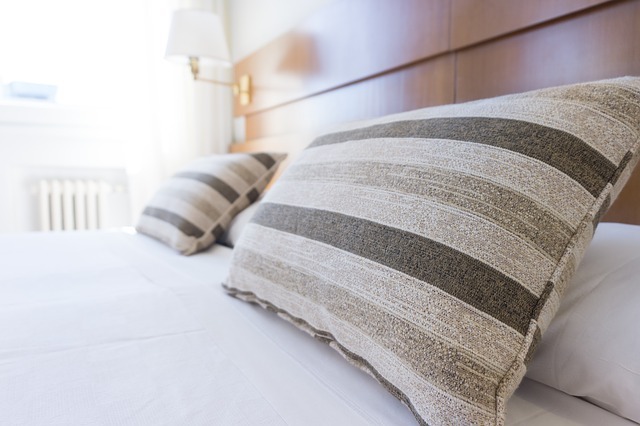 An air purifier may not be effective in removing dust mites hiding in the mattress. But it can trap a good amount of what you send into the air when you’re making the bed. Besides, if you’re living off a busy street, there are bound to be specks of dust hovering in the air and waiting to settle down in various parts of your bedroom. When getting an air purifier, there are two important factors to consider. The first is whether the air purifier consists of a HEPA filter. It’s a filter that traps fine particles, including dust mites. Without the HEPA filter, the air purifier is just an ineffective ventilating fan. You’ll also want to take the capacity of the air purifier into account. Some air purifier is rated for a smaller space while some works for large rooms. Ensure that the air purifier adequately supports the area of your bedroom. Take note that you’ll need to replace the HEPA filter every six months or less, depending on the air quality of your home. Ventilation, or the lack of, can be a contributing factor to the growth of dust mites in your bedroom. This is even more so when the bedroom has an adjoining bathroom. The high concentration of vapor in the air provides a comfortable environment for dust mites to grow. Dust mites enjoy an incremental growth in humidity between 80% to 90%. That is way beyond the optimal range of humidity for humans, which is between 30% to 60%. Lowering the humidity in the bedroom helps to prevent dust mites from growing. You can ensure that your bedroom is not too humid by allowing proper ventilation. Ensure all the windows and door are open for the air to flow. It also helps to keep the bathroom dry and ensure the exhaust fan is turned on to drive the vapor out. If these are a hassle for you, getting a dehumidifier is a good alternative. It helps to maintain the air in the bedroom to the desired value. You can have all the best tools and equipment installed in the bedroom. But if you’re slacking in washing the beddings, your effort in ridding the dust mites may be futile. The pillows and mattress are favorite spots for dust mites to grow, as they trapped all the dead skin cells that you shed. It makes perfect sense to wash the bedsheets, pillowcases, comforters and other beddings regularly. When my son’s allergy is at its worst, I wash the beddings at least once a week. Dust mites could not survive high temperature. You can turn on the heat of the washer or dryer to ensure the dust mites are destroyed. Take no chances when it comes to keeping your bedroom dust mite free. Keeping a bottle of dust mites spray ready ensures that the microscopic pests are kept in check regularly. If you’re worried about the chemicals in pesticides, you should use non-toxic dust mite sprays. They are made of ingredients that are people and pet-friendly. Some are formulated from essential oils, such as eucalyptus and clove, which are known to be very effective against dust mites. Using dust mites spray is relatively simple. You’ll just need to spray the solution on the intended surface and leave it for about 30 minutes. Then vacuum or use a cloth to wipe the surface to remove dead dust mites. Considering the bed is where you spent the most time with, you’ll want to prevent dust mites from nesting in it. When they are buried deep in the mattress, eliminating the dust mites can be tough. There are generally two ways in getting your bed dust mite-proof. The first involved opting for a hypoallergenic mattress. Such a mattress is made with fabric that is sewn in such a way that there is no gap for dust mites to pass through. This ensures the inner core of the mattress is free of dust mites. Alternatively, you could get mattress and pillow covers for dust mites. They are made with synthetic materials like vinyl or plastic that leaves no space for dust mites to squeeze through. Occasionally, you may want to declutter your bedroom, as too many items lead to a crowded space and possible traps for dust. It may be time to say goodbye to the life-size plush doll if you’re allergic to dust mites. Or you may decide that you probably don’t need a carpet in the bedroom after all. Adopting a minimalist concept for your bedroom can make a difference in keeping the dust mites under control. You may not need to apply every single step above to remove dust mites from your bedroom. With that said, it will be wishful thinking if you assume that you could keep them under control only with a couple of steps. Keeping dust mites under control is a tough continuous effort. I still did more than half of the above tips now even though my son’s allergy has been kept to a minimum. I hope these tips helped you to ensure a bedroom that is free from dust mites. Do you have any other tips to share? Let me know in the comment below. Hi! I was actually cleaning my room this morning and I found out that there are dust mites in my bed. So I searched some solution on how to get rid of it. But most of the articles are about bug sprays. I can’t use that because I have an asthma. Thanks to your article, I did some of the steps and it works! Appreciate it! Thanks! I suspect that you’ve stumbled on bed bugs. Dust mites are pretty invisible to human eyes. Anyway, bed bugs are equally irritating and you’ll want to get rid of it. Wow! Your article takes the phrase, ‘don’t let the bed bugs bite’ to a whole new level. My Mother-in-law has lung disease and needs to keep her home free from dust as much as possible in order to not aggravate her condition. I will send this article to her! I think it could help her a lot. I’m glad you find this article helpful. Bed bugs do bite but dust mites don’t. That’s why it’s harder to know if you had dust mites around until you start having allergies. All those tips are great, they are indeed a real pain to have around the house. Thank you for sharing this content. Please carry on giving us valuable advices ! Thanks for loving the tips. Wow, I’m so glad I found this site. My daughter has dust mite allergies, and I am not probably not very effective at managing her room to get rid of them. This is an excellent reminder of what I need to do to help minimise her symptoms. I love that you’ve created a convenient list to follow. I didn’t realise that bicarb helps kill dust mites! I should have known as this stuff has hundreds of uses. It certainly does take more time and effort to help our kids manage their dust mite allergies, but hey, we love them so we do what we can for them. Thanks for creating a helpful post. I’m glad this post offers some help. It’s tough when children are suffering from allergies. Hope they’re getting better soon.